These copycat Levain Bakery Chocolate Chip Cookies are a giant, thick cookie that are slightly crispy on the outside and delectably soft and gooey on the inside. They’re pretty much to die for. I’ve been to New York only once in my life about 12 years ago. I wish more than anything that I would have known then about Levain Bakery and their famous Chocolate Chip Cookie. I definitely would have waited in line no matter how long the wait was. It’s no secret I have a cookie addiction, so after hearing so many rave reviews from people about Levain Bakery’s cookies, you have to know I would go on the hunt for a copycat Levain Bakery Chocolate Chip Cookie recipe. Since I’ve never tried the real deal, I had nothing to compare it to. But this copycat recipe is amazing and if these taste anything like Levain Bakery’s cookie, then I am a fan for life. I know there are mixed reviews in the world about these cookies. Some of you absolutely love them, while others think they are over-hyped. I’m obviously on the love them side of the spectrum. I literally felt like I died and went to cookie heaven the first time I made these. 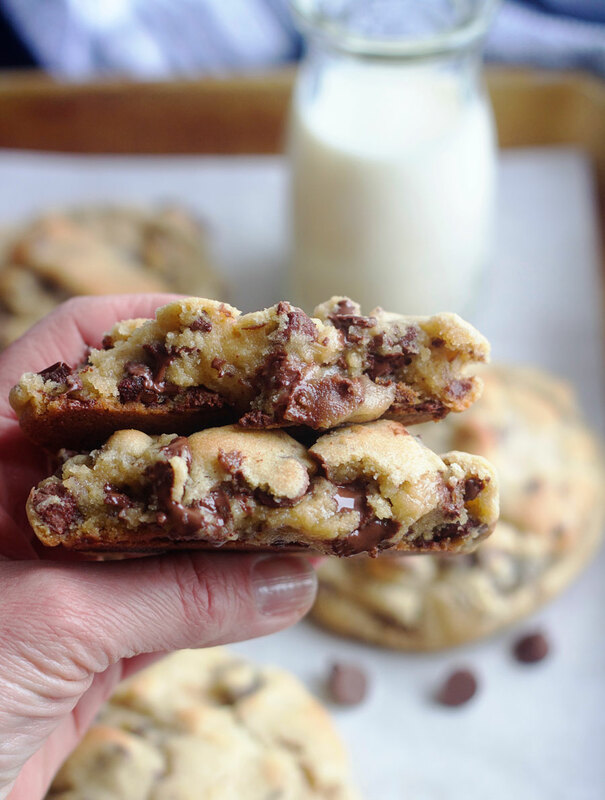 First off, the dough is just ridiculously good and the cookies. . . oh my! I absolutely could have eaten all eight ginormous cookies. They’re amazing! Use cold butter and cut it into small cubes. Since it’s cold, cutting it helps it blend quicker and easier with the sugar. Make sure you don’t overbake these cookies. They will continue to cook even after you take them out of the oven. You want the insides to be gooey still and the outside to be golden. These cookies need to sit on the cookie sheet for about 10 minutes before eating. Leave the cookies on the cookie sheet so they finish baking and set up. I like to use my large cookie scoop and scoop out “rough balls”. I use my kitchen scale to measure each dough ball so they are all the same size. Apparently, the Levain Bakery cookies have no vanilla in them. I’ve made these cookies with and without vanilla and love them either way. I usually end up adding vanilla just out of habit, but you be the judge here. These cookies freeze really well and are absolutely delicious frozen. Yes, 410 degrees is the right temperature. By baking at a high temperature, the outside of these cookies is crispy and the middle barely gets baked which gives you a gooey center. Yes, you can omit the nuts (I DO!) but make sure you read my notes at the bottom of the recipe card. You need to replace the volume of the nuts with another substance. You can bake these cookies right away, or scoop out the dough balls onto your cookie sheets, cover and refrigerate for 45-60 minutes. Refrigeration isn’t necessary, but it does give the cookies a deeper flavor. Cake flour makes these cookies more tender, so I highly recommend it, but if you’re in a pinch and don’t have any, you substitute all-purpose flour or make your own (*SEE RECIPE NOTES). Like I talk about in the recipe notes, I don’t love nuts in cookies, so I omit them. If you don’t add enough flour and chocolate chips to make up for the volume of the nuts, your cookies will be a little flatter. You can see a difference in thickness in the above picture compared to the picture at the top. They’re both equally delicious, one is just a little flatter. You’re going to love these cookies. Just please don’t hate me when you can’t stop eating them and have to do 1,500 jumping jacks to burn all of the calories you consumed. You guys HAVE to make these, they’re absolutely phenomenal! Preheat oven to 410 degrees. Line cookies sheets with parchment paper or silpat liners. In the bowl of an electric mixer, cream together the cold cubed butter, brown sugar, and sugar 3 to 4 minutes or until creamy. Add vanilla and eggs, one at a time, mixing well after each one. Stir in both flours, cornstarch, baking soda, and salt. Mix until just combined (don't over mix). Stir in chocolate chips and walnuts (if using). Bake for 9-11 minutes or until golden brown on the top. Let them rest for 15 minutes to set up. am not a fan of nuts in cookies, so I leave them. But you have to replace the volume of the nuts so the cookies will hold their shape. So I add an extra 1/3 to 1/2 cup of all-purpose flour and an extra 1 1/2 cups of chocolate chips. 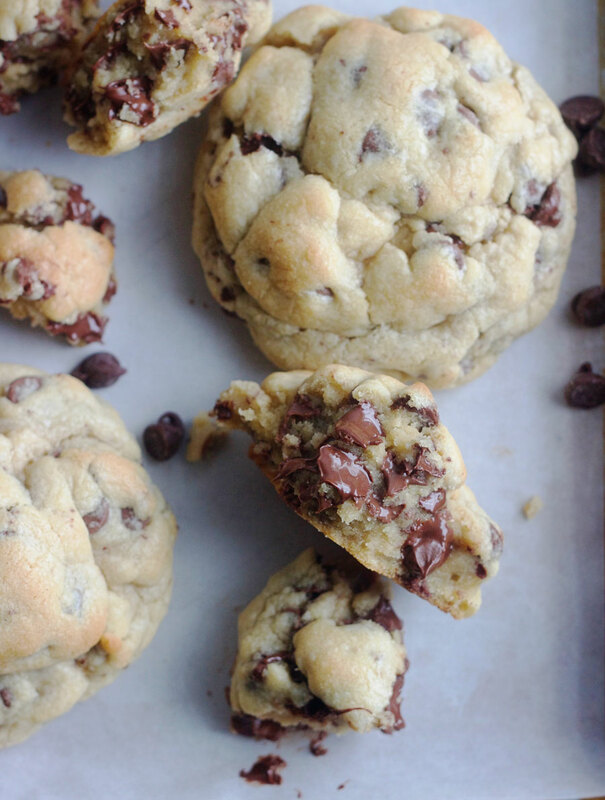 I know that seems like a lot of chocolate chips, but I promise it makes these cookies even more amazing. 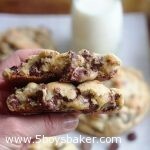 I use half milk chocolate chip and half semi-sweet. Cake Flour can be found in the baking aisle of most grocery stores. I usually buy it in bulk at Winco because it's super inexpensive there. If you can't find it or don't want to buy any, you can make your own. Measure out 1 cup of all-purpose flour. Remove 2 tablespoons of the all-purpose flour and place it back in your flour container. Replace the 2 tablespoons of flour with 2 tablespoons of cornstarch then sift the flour 4 to 5 times. It seems like all the chocolate chip cookies I make go flat, like a pancake, and so when I add more flour it just seems to make the cookies dry and tough. I’ve been told it’s the high altitude of where I live. Will this recipe work at high altitudes? Or can you recommend a great chocolate chip cookie recipe for high altitudes? I’m tired of pancake cookies. Hi Jane! 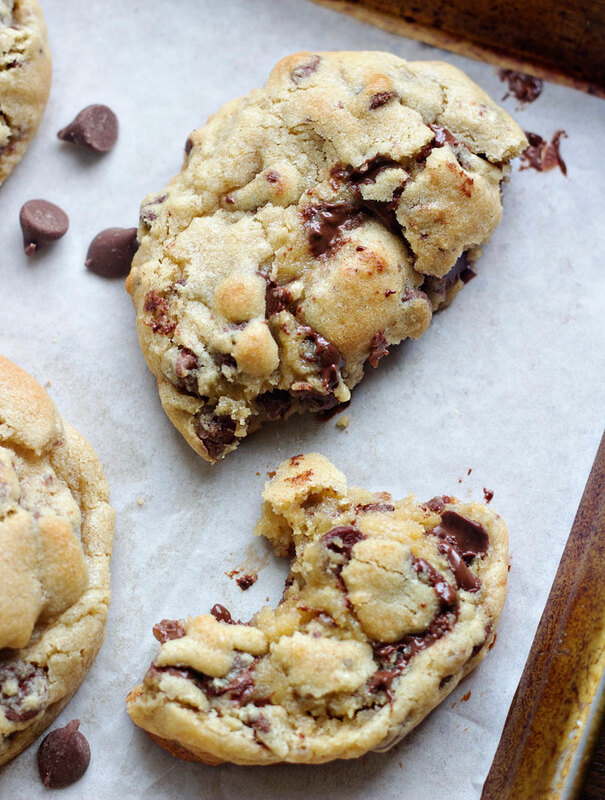 I almost always add a little more flour to most chocolate chip cookie recipes, even if it’s only 2 to 4 tablespoons and they never are dry and tough. The secret is to not overbake them. I know Ron likes his cookies crunchy, so that’s a problem (lol!). This cookie recipe turns out perfectly thick and puffy every time, even the few times I haven’t added as much flour, they’re still thick. I’m sure it’s partly because of how big the dough balls are, but even when I’ve made them smaller, they still stay thick and puffy. I think you’re only about 300 feet higher in elevation than we are, so these cookies should work great. If you ever make the Nestle Tollhouse recipe, you absolutely have add more flour. The recipe calls for 2 1/4 cups and I add 2 3/4 cup, if I don’t add the extra flour, they go flat as a pancake. Also, don’t overmix your dough. I always keep my mixer on low and once I add the flour, I mix the dough just until it’s combined. 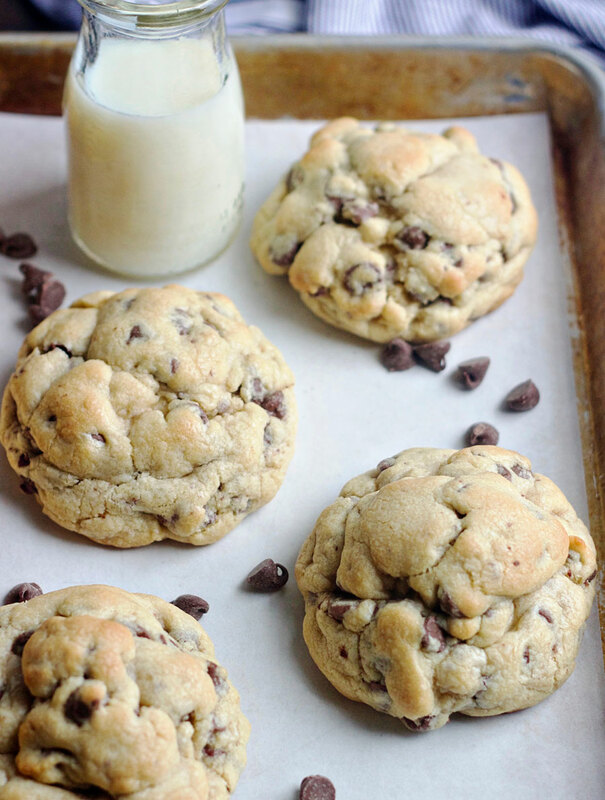 Chilling your dough, even for 30 minutes, also helps keep your cookies from going flat. I hope this helps. Awesome! Thanks! I will definitely give this recipe a go! How many eggs? I don’t see them listed in the recipe just mentioned in the notes. Oops, sorry about that, I just fixed it. It’s 2 eggs. Jodi I am dying to make these. My younger son goes to Fordham University in the Bronx and every time we visit we say we need to go to Manhattan to get one of these cookies. So many things to see and do there but we have to definitely make time to try a cookie and weigh in on them. In the meantime yours look fabulous. I am in the midst of a kitchen renovation now but when It’s done I am definitely making these. Oh you’re going to love these cookiesTeresa. How exciting you’re doing a kitchen remodel. I would love to see pictures of it. Oh but what a mess you’re probably in. Good luck with everything. Hi Holly! I’m so jealous you’ve had a real Levain Bakery cookie (lol). You’ll have to let me know what you think of these.